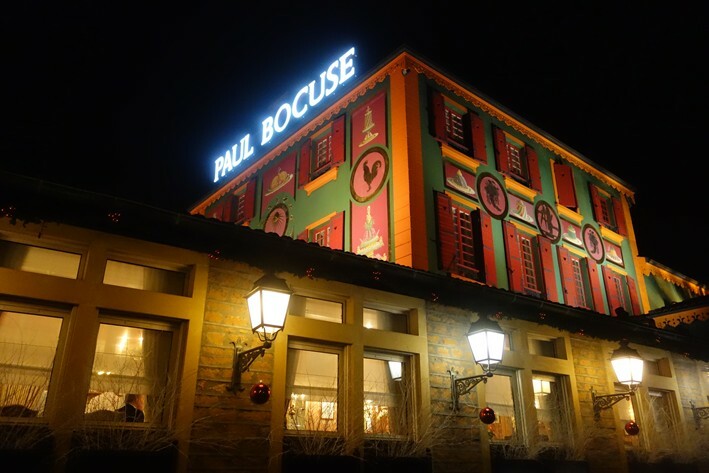 Paul Bocuse’s father married in 1921 a lady whose parents ran a restaurant called Auberge du Pont de Collonge near Lyon, and Paul himself was born five years later. The young Paul went off to learn his trade, and trained at some of the best restaurants in France at that time: Mere Brazier, Lucas Carton and La Pyramide, amongst others. In 1959 he returned to the family business and took over the kitchen. 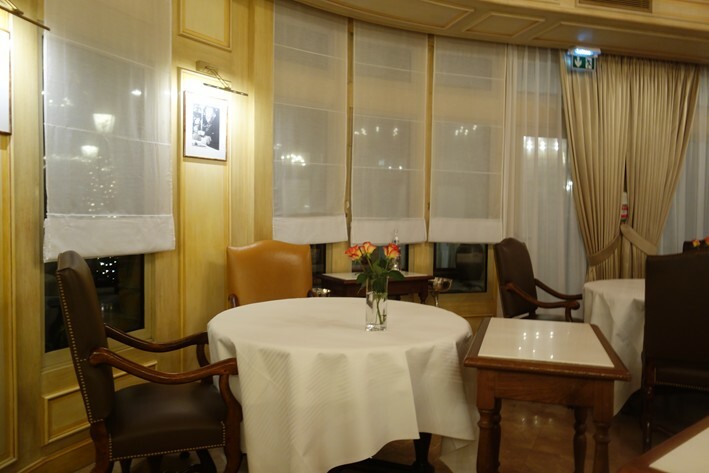 He gained three Michelin stars for the restaurant by 1965, at which point he renamed it Paul Bocuse. This trio of Michelin stars have been retained ever since, and Mr Bocuse has built his name into a global culinary brand. The international culinary competition Bocuse d’Or (which started in 1987) is just one example of this, and such is his status in France that the main food market in Lyon, Les Halles, was in 2006 renamed “Les Halles de Lyon Paul Bocuse”. 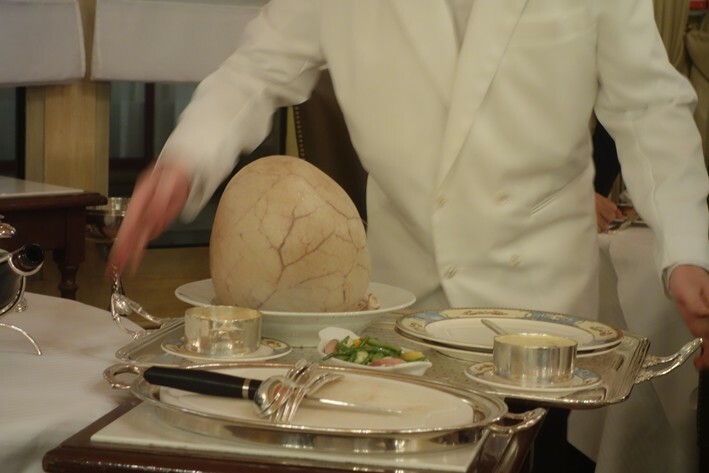 In 1975 he created for President Giscard d’Estaing a black truffle soup served in a bowl crowned with a pastry cap; this became the signature dish of the restaurant. 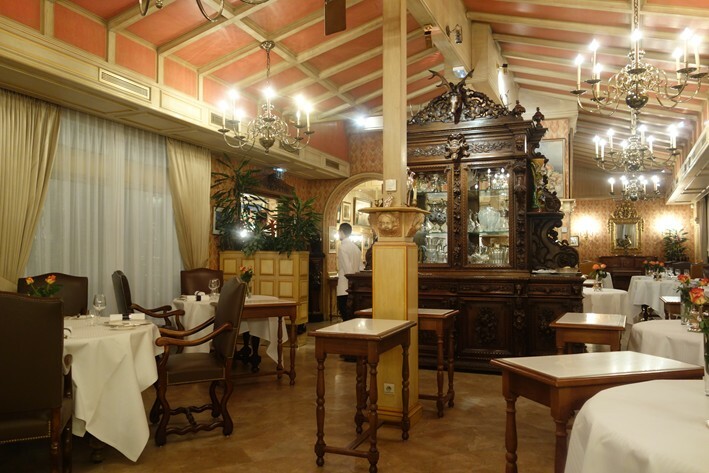 Despite his advanced years, Mr Bocuse can still be found on occasion in his dining room. On the outskirts of Lyon, the building that houses the restaurant could not be described as subtle. With pink walls and a vast neon sign, it looks like the product of a Las Vegas designer on hallucinogens. The dining room is mercifully more discreet, with a lovely wooden dresser in the centre of the room, well-spaced tables and immaculately ironed white linen tablecloths. Assorted tasting menus were available at €160, €210 and €250 as well as a full à la carte choice. The wine list was exclusively French, with a full page devoted to the prestigious winery of E. Guigal, located not too far from here in Ampuis. 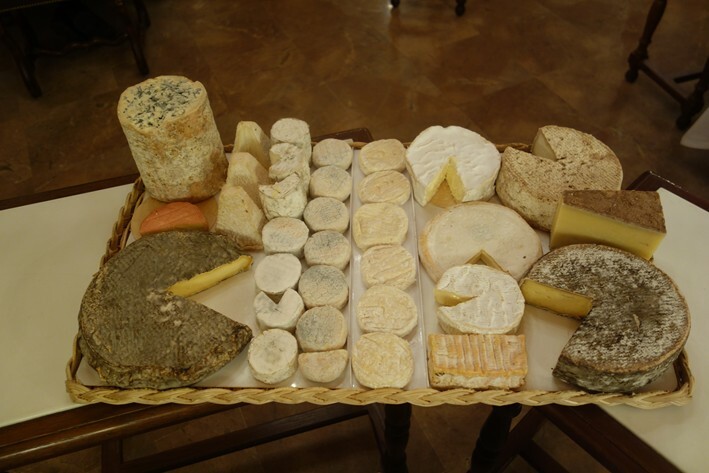 Example labels were Faiveley Clos Rochette 2011 at €60 for a bottle that can be found in the high street for €31, Etienne Sauzet Puligny Montrachet 2010 at €130 for a wine that retails at €105, and Guigal Brune et Blonde 2009 at €150 compared to a shop price of €61. At the posher end of the list Guigal La Mouline 1995 was €850 compared to a retail price of €504 and Fontaine Gagnard Le Montrachet 2008 was €1,100 for a wine that can be found for €634 in a shop. 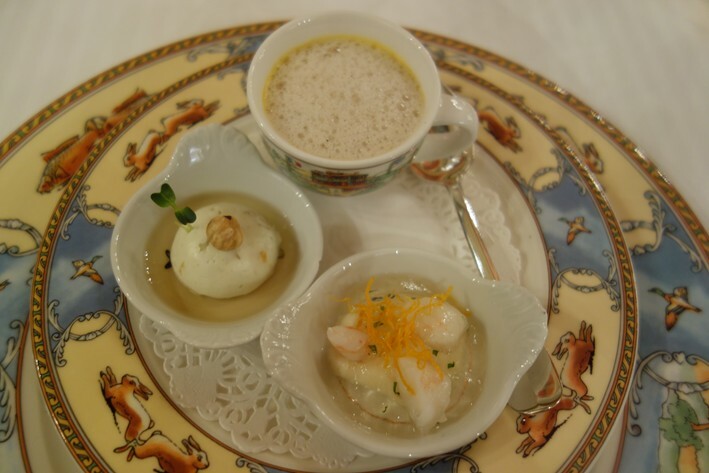 Nibbles comprised crevettes with celery mousse, pumpkin soup and a Roquefort mousse with hazelnut. 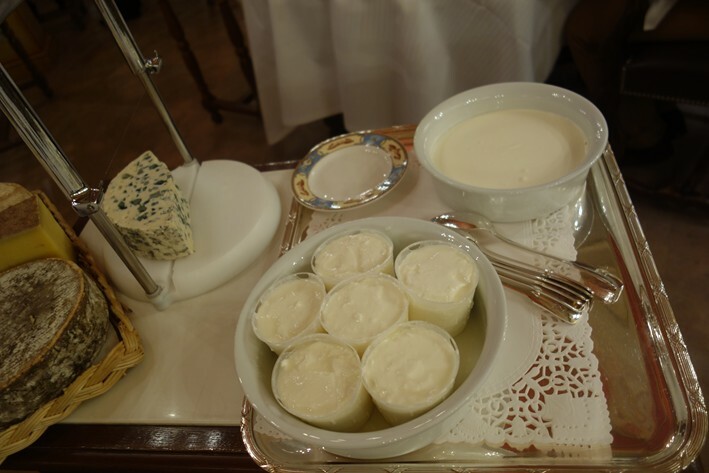 The soup was nicely fluffed up and was not too sweet, the cheese and hazelnut combination worked well and the shrimps were pleasantly sweet, tender and balanced by the earthy taste of celery (18/20). The bread was supplied by the bakery Jocteur on the Ile de Barbe, and to be honest it was not great. Baguette was a little hard, a roll was better and a chestnut bread with the cheese was fine, but this was at best 14/20 level. Given the stunning bread that can easily be obtained in Lyon from bakeries such as Pozzoli and Boulangerie Palais this seemed a rather lackluster effort for such a prestigious restaurant. 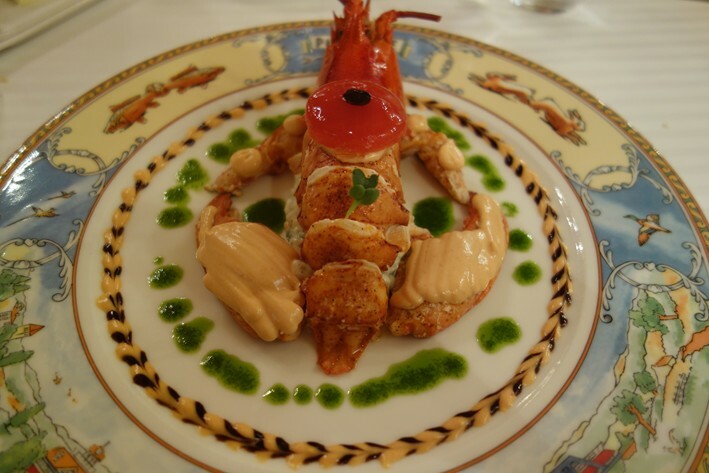 Lobster was tender, served with Marie Rose sauce and came with a salad of chopped potato, peas, carrots and mayonnaise. The shellfish itself was excellent, though why it was sourced from Maine rather than Brittany was unclear to me. However the sauce was expertly made and the salad good (17/20). Next was the signature truffle soup. 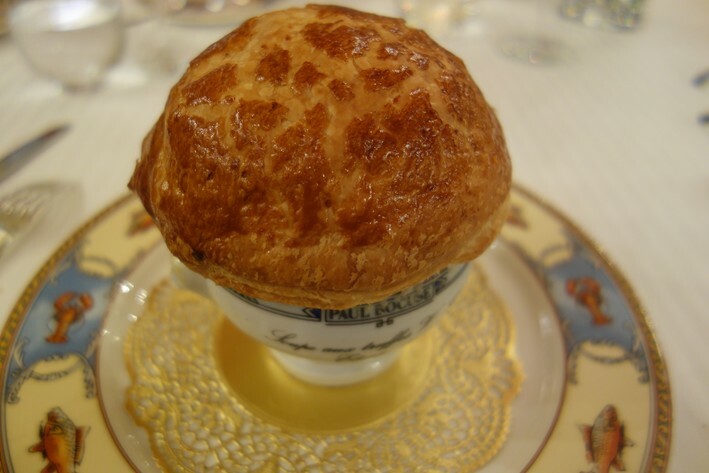 A beef consommé with foie gras and diced vegetables (celery, carrots, onions, mushrooms) along with a generous portion of black truffles was served in a bowl covered with puff pastry to seal in the aromas. 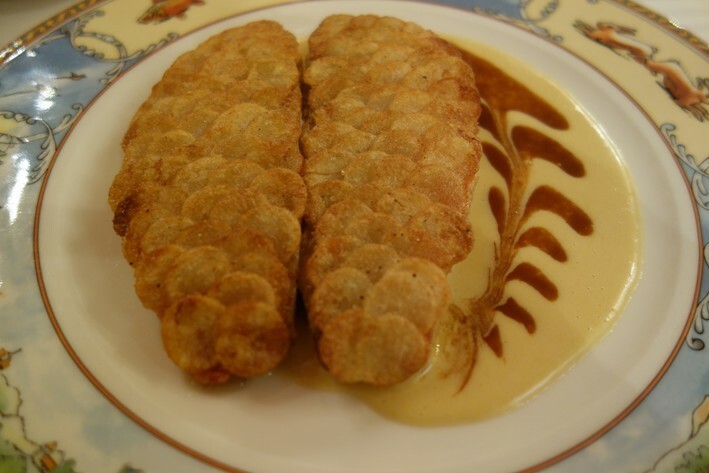 The lovely scent of the truffles is released when you cut into the pastry topping, and the dish worked well - the pastry was delicate, the soup having enjoyable though hardly remarkable flavour (perhaps 17/20 if I am kind). Red mullet with potato "scales" was the dish of the night, the fish being superb, the potato crisps delicate, the butter sauce cut through nicely with balsamic vinegar to relieve the richness (19/20). A bowl of vegetables on the side were less impressive, slightly overcooked. 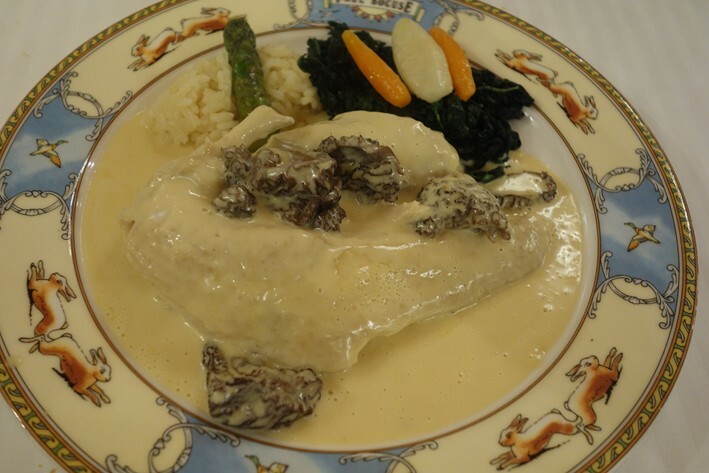 Bresse chicken was served with morels and cream sauce as well as a bed of spinach, rice and (bizarrely) an asparagus spear. This being November, it unsurprisingly lacked flavour and was also rather overcooked; it turned out to be from Alicante, and would have certainly been grown in a polytunnel rather than the open air, assuming that the origin was indeed as claimed – in any case it had no place on this plate. Fortunately the rest of the dish was lovely, the chicken having plenty of flavour, the morels excellent and the spinach carefully cooked (17/20). 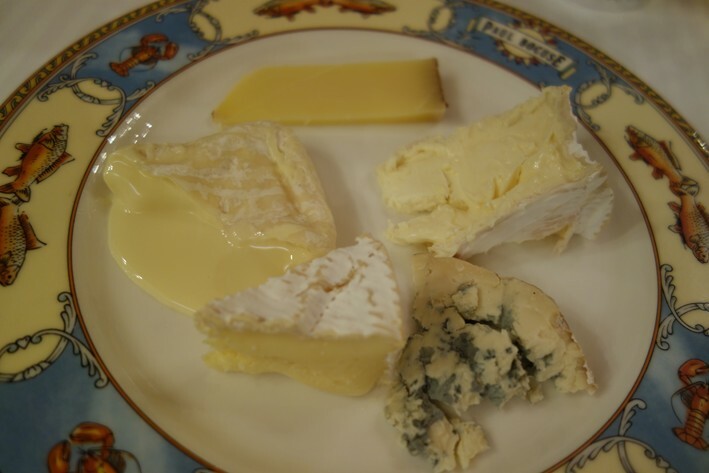 Cheese from local supplier Mere Richard was in excellent condition: St Marcellin, Camembert, Comte, Brillat Savarin and Fourme d'Ambert were all very good. Pre-dessert was a little chocolate pot with cherry, the silky texture and deep flavour a world away from the versions that many of us have encountered at overly ambitious dinner parties (17/20). 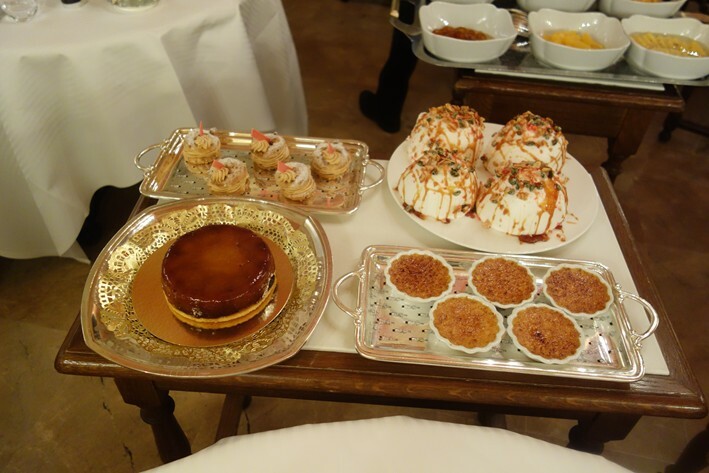 An impressive array of desserts were brought to the table to choose from: there was rum baba, ile flottante, fruits, ice creams, creme brûlée, chocolate cake,... 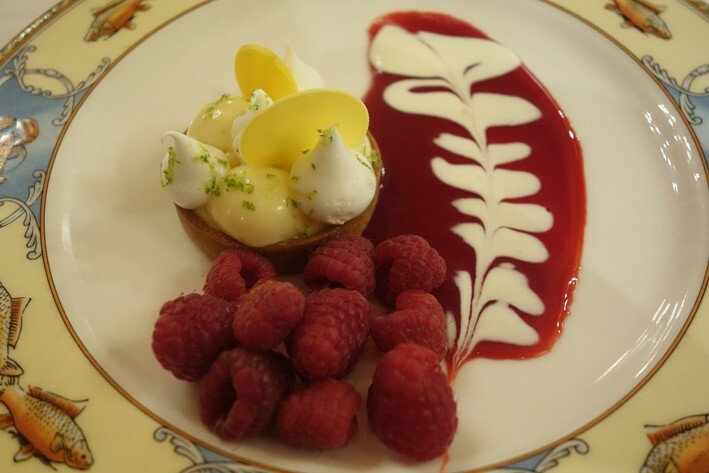 Lemon tart was very good, though served with unseasonal raspberries (from Spain, apparently), the filling well balanced and the pastry good (17/20). 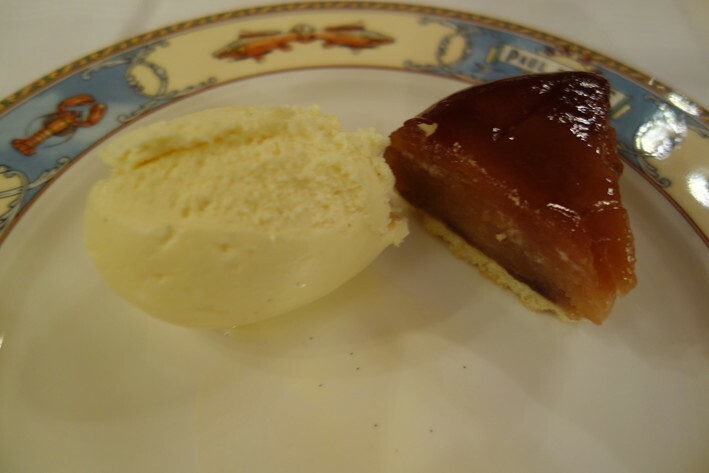 Apple tarte tatin was also enjoyable, with nicely caramelised apples and more classy pastry, served with lovely vanilla ice cream (17/20). Coffee was excellent. A sense of just how timeless this restaurant is can be discerned from the fact that we were served by the same waiter tonight that looked after us 18 years ago (he had been working here for 24 years). The bill came to €293 (£234) albeit with pre dinner drinks and a very good bottle of wine. If you shared a modest bottle of wine then a typical bill would be around £175 a head. This is hardly cheap but neither it is excessive by the standards of top end restaurants in France. Of course this is not exactly the cutting edge of cuisine - no live ants or sea buckthorn are likely to disturb the pages of the menu here. However, other than the caveats noted, the cooking was actually very good indeed within its context. If you want the very finest classical cuisine then you can do better elsewhere e.g. 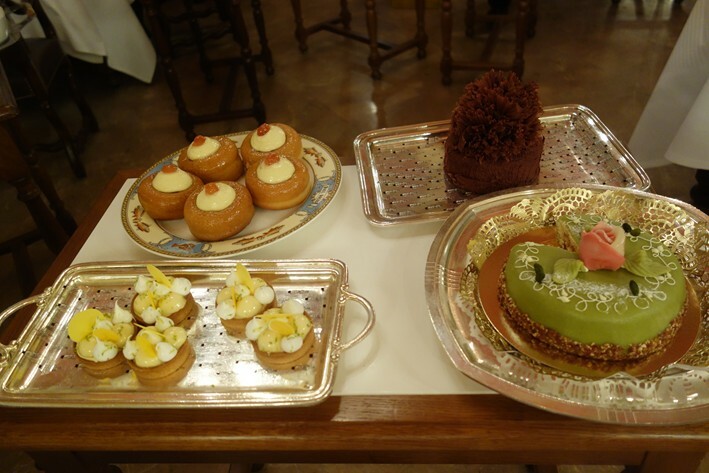 at Michel Guerard, Hotel de Ville and Sonnora. The third star for Bocuse seems distinctly generous, but I cannot see Michelin changing its score for this iconic restaurant any time soon. Be that as it may, this is still excellent food, enjoyable and unashamedly rich. A meal here feels a little like eating in a museum of food, but a very good museum. 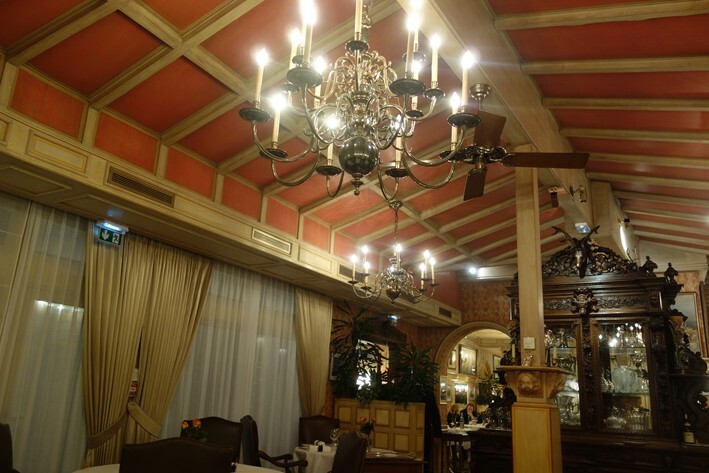 Paul Bocuse is a lovely restaurant with an excellent menu. It's signature truffle soup is a true culinary gem. 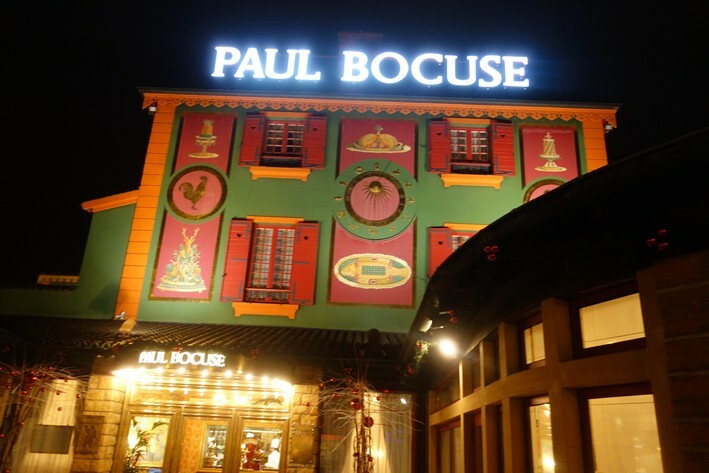 Paul Bocuse is undoubtedly the finest restaurant. From arrival to departure no where have we ever experienced the finest food, service, attention to detail. It is a value. If you are a regular customer you come to experience magic of the kitchen. 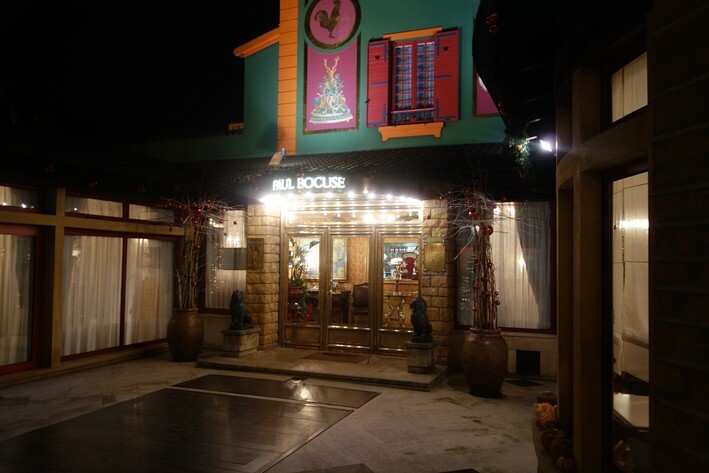 Sometimes criticised..but really a lovely experience...and i would love to try the truffle soup again..